because my husband insisted it was time for a lil mummy break. So, off I skip for a lil me time combined with some retail therapy. I was actually needing to buy a pair of shoes to wear to a wedding. I was seriously having one of those days where I fell in love with at least three pairs. Eventually I decide to purchase the wedding pumps that I needed. They are bit cute (see happy snap below) yet on a day to day basis impractical for a busy mumma of two. So I reluctantly leave the store still thinking about the super comfy fabric shoes I had just tried on and how I wished to have them too. A 1/2 metre of 2 way stretch Netting (this is oodles of fabric, it will make two pairs). Cut 3 X 8" by 22" pieces of fabric. Cut 1 of those (8" by 22") pieces directly in half so that you now have (2 x 8" by 11" slips of fabric). *If you have a really big sized foot you may need to increase the 22" of fabric length needed to go around your foot. Measure around your toe and ankle just to be sure! 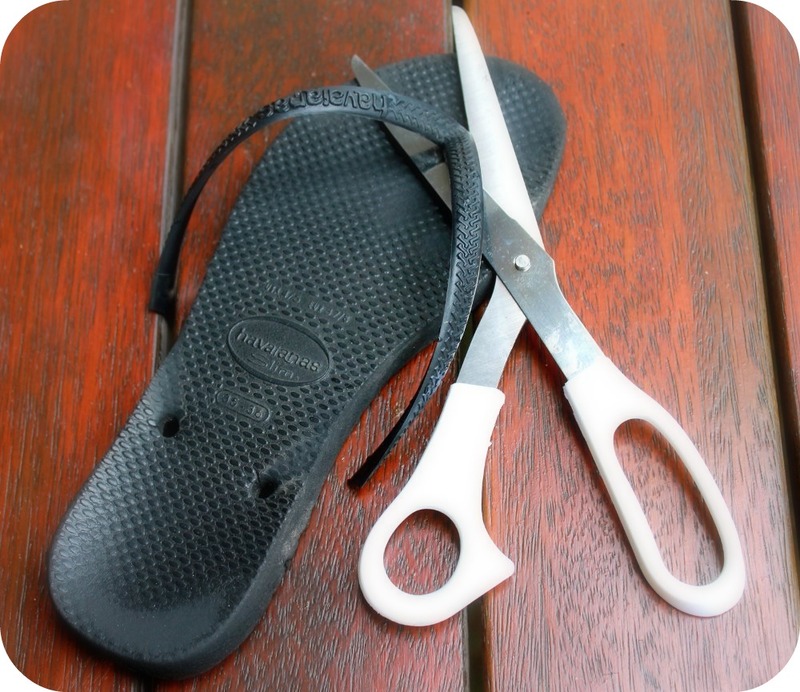 Snip all of the existing straps off your flip flops so that you now have a bare flip flop sole. Grab 1 x of your 8" by 22" slip of fabric. Hold the outer edges of your fabric length ways and fold edges inwards so that they meet in the middle (this will be the underside of your flip flop strap). Turn over and measure long ways around your foot so that each end of the fabric joins, just near your big toe. Tie a knot with both ends, in the space just before your big and second toe. 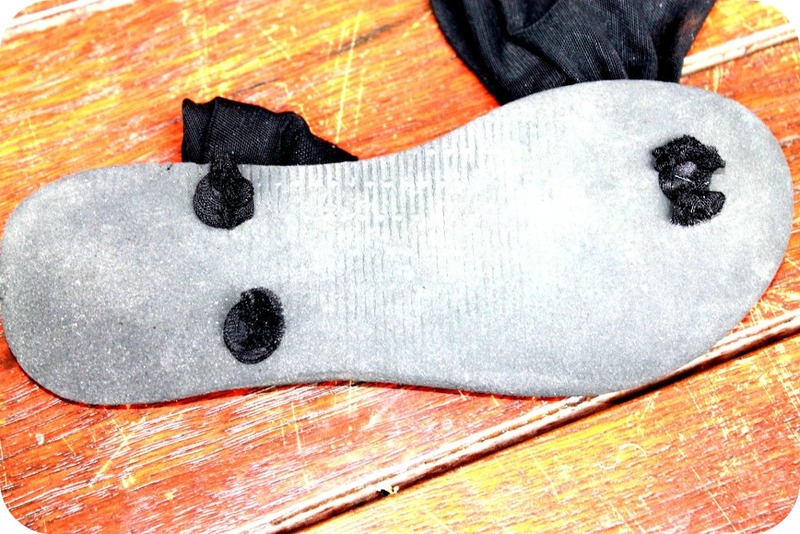 Push both ends of the fabric through the middle top hole of your flip flop and tie a double knot underneath. Leave enough room for your toes to go through at the top. Make your knot very tight and as small as you possibly can by pulling on the fabric tightly. Snip fabric ends off neatly just after the knot. Push knot up into the flip flop hole, mine sat very nicely inside the hole however you could also use a rubber glue to secure/ protect your knot in its place. Grab your 1 x 8" by 11" slip of fabric, fold the edges of the longest side inwards so that they meet in the middle (this is the underside). Measure the top side over the arch in your foot. Tie one end underneath your flip flop and snip end off (push entire knot into hole) and repeat on other side. *Repeat this entire process on your other foot to complete your other flip flop. Great idea and so much more stylish than the plastic/rubbery flip flop. Thanks Karen, love your blog... always such great ideas! Awesome idea! they are beautiful!